The Venus Factor, Vic Ghidalia & Roger Elwood, eds. (1972) This is the earliest women-only sf anthology of which I’m aware. 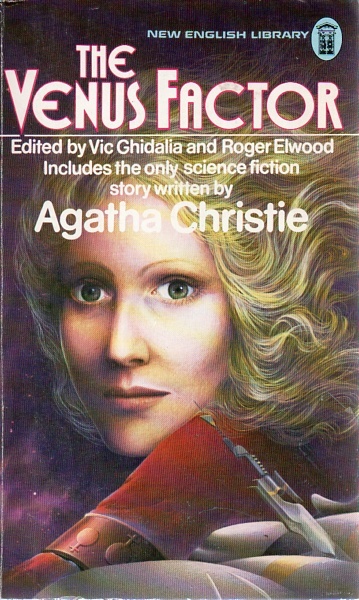 It appears to have been sold on the fact it contains “Agatha Christie’s only science fiction story”, ‘The Last Séance’. The remaining stories are by Cynthia Asquith, Gertrude Atherton, Miriam Allen deFord, and the more familiar Zenna Henderson, Anne McCaffrey, Judith Merril and CL Moore. It covers most of the decades from sf’s beginnings to the book’s publication, with Christie’s story from the 1920s, three from the 1930s, one from the 1950s and three from the 1960s. Women of Wonder, Pamela Sargent, ed. 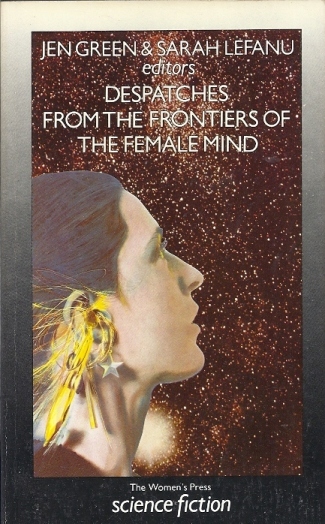 (1975) Perhaps the most celebrated of the women-only sf anthologies – or rather, the trilogy which this book begins is perhaps the most celebrated. Sargent lays out her agenda in an excellent introduction (in fact, all three Women of Wonder anthologies are worth getting for Sargent’s introductions) – this is more than just science fiction “by women about women”, it’s about women’s place in the genre, and in the history of the genre, as both protagonists and writers. There are no obscure names in the table of contents, and one story even won a Nebula Award. The stories are by Sonya Dorman, Judith Merril, Katherine McLean, Marion Zimmer Bradley, Anne McCaffrey, Kit Reed, Kate Wilhelm, Carol Emshwiller, Ursula K Le Guin, Chelsea Quinn Yarbro, Joanna Russ and Vonda N McIntyre, and date from 1948 to 1973. I reviewed it on SF Mistressworks here. 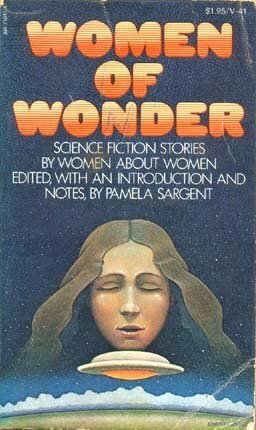 More Women Of Wonder, Pamela Sargent, ed. 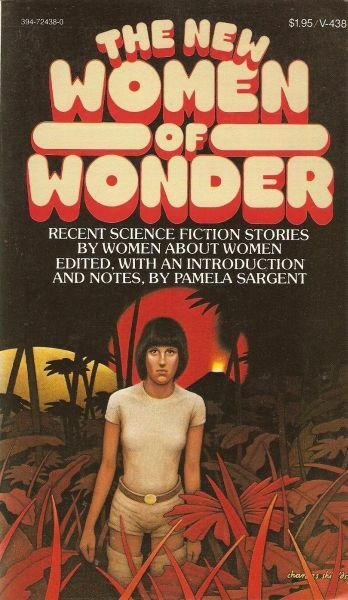 (1976) Although the Women of Wonder anthologies were plainly intended to demonstrate that, “Look! Women write science fiction too!”, Sargent does seem to draw her contributions from a relatively small pool. Admittedly, she explains that the anthologies are as much about sf stories about women as they are sf stories by women. Appearing in this volume are CL Moore, Leigh Brackett, Joanna Russ, Josephine Saxton, Kate Wilhelm, Joan D Vinge and Ursula K Le Guin, three of whom appeared in the earlier volume. I reviewed the anthology on SF Mistressworks here. 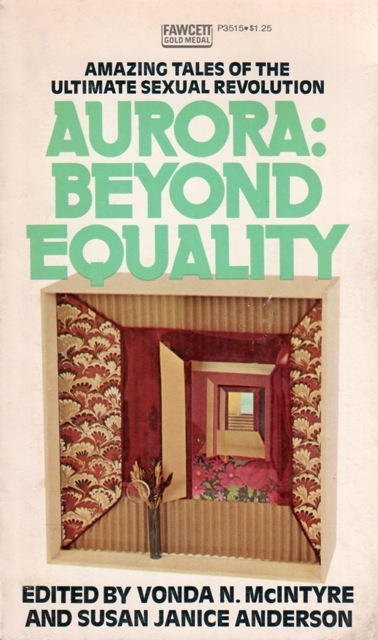 Aurora: Beyond Equality, Vonda N McIntyre & Susan Janice Anderson, eds. (1976) This billed itself as a “feminist science fiction anthology” because its contents were not contributed wholly by women – three of the stories in the anthology were by men, David J Skal, PJ Plauger and Craig Strete. The remaining stories were provided by James Tiptree Jr (twice), Mildred Downey Broxon, Ursula K Le Guin, Joanna Russ and Marge Piercy. The stories are all original to the anthology. 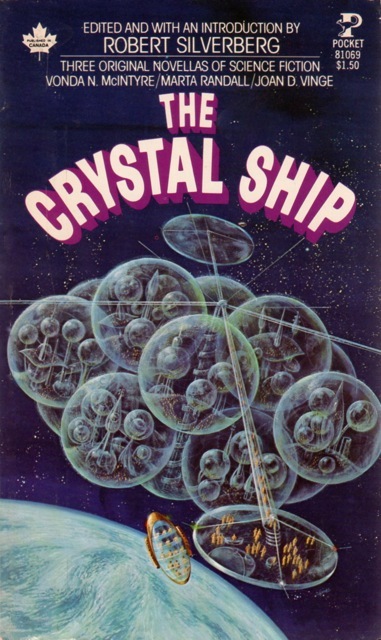 The Crystal Ship, Robert Silverberg, ed. (1976) Although a male sf writer’s name appears prominently on the cover of this book, it actually contains three original novellas by women: ”The Crystal Ship’ by Joan D Vinge, ‘Megan’s World’ by Marta Randall and ‘Screwtop’ by Vonda N McIntyre. The last also appeared in The New Women of Wonder (see SF Mistressworks review here), and was published in 1989 as one half of a Tor double with James Tiptree Jr’s ‘The Girl Who Was Plugged In’. Millennial Women, Virginia Kidd, ed. (1978) Kidd was a member of the Futurians and an influential editor. 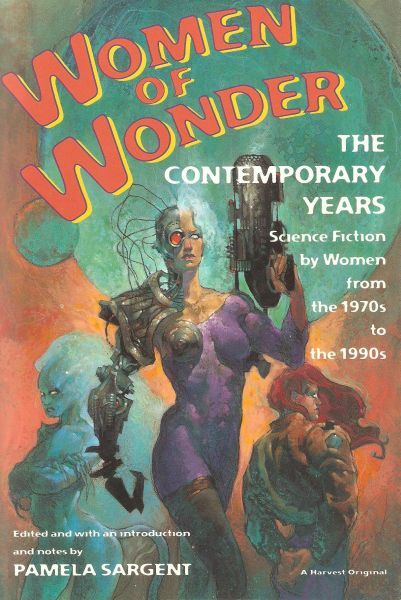 While this anthology is perhaps not as strong as any of the Women of Wonder anthologies, it does present a wide variety of sf stories – provided by Cynthia Felice, Marilyn Hacker, Diana L Paxson, Elizabeth A Lynn, Cherry Wilder, Joan D Vinge and Ursula K Le Guin. Some editions of the book were sold as Le Guin’s short novel, “Eye of the Heron and other stories”, with Le Guin’s name most prominent on the cover. I reviewed it on SF Mistressworks here. The New Women of Wonder, Pamela Sargent, ed. (1978) The third and final Women of Wonder anthologies until their 1995 reboot. Sargent once again turns mainly to women writers she has previously published – only Eleanor Arnason, Pamela Zoline and James Triptree Jr are new in this volume. Mind you, their three stories are pretty much stone-cold classics of the genre. Also inside are stories by Sonya Dorman, Vonda N McIntyre, Josephine Saxton, Kit Reed, Carol Emshwiller, Joanna Russ, Chelsea Quinn Yarbro and Joan D Vinge. This volume is the strongest of the three. I reviewed it on SF Mistressworks here. 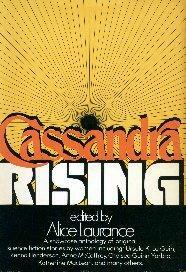 Cassandra Rising, Alice Laurance, ed. 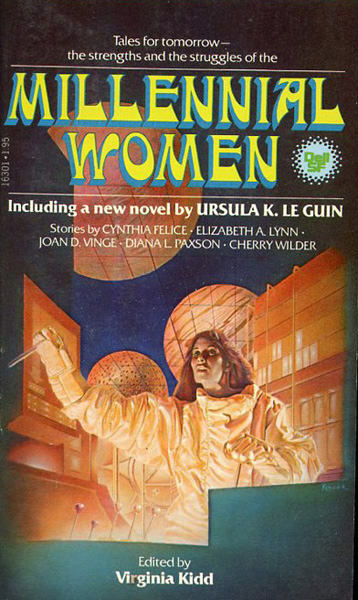 (1978) Not an easy book to find, this anthology contains nineteen original stories by Ursula K Le Guin, Kay Rogers, Joan Bernott, Zenna Henderson, Katherine MacLean, Kathleen Sky, Rachel Cosgrove Payes, Josephine Saxton, Grania Davis, Raylyn Moore, Alice Laurance, Anne McCaffrey, Steve Barnes, Barbara Paul, Sydney J Van Scyoc, Beverly Goldberg, Miriam Allen deFord & Juanita Coulson, Jacqueline Lichtenberg and Chelsea Quinn Yarbro. Steve Barnes, incidentally, is not male writer Steven Barnes but the pen-name of Margaret L Barnes (an introductory note explains she used the name “as a way of preserving her family name, Stephenson, lost in marriage”). Judging by some of the introductory comments to the stories made by Laurance, this was an open submission anthology, which may explain the presence of the more unfamiliar names. There is also a foreword by Andre Norton. Asimov’s Space of Her Own, Shawna McCarthy, ed. (1983) As the title indicates, this anthology contains women-authored stories originally published in Isaac Asimov’s Science Fiction Magazine. Asimov’s regularly published themed anthologies of contents drawn from the magazine – McCarthy herself edited four of thirty such anthologies. The contents date entirely from 1981 to 1983, and are provided by Connie Willis, Mary Gentle, Leigh Kennedy, Sydney J Van Scyoc, Ursula K Le Guin, Pamela Sargent, Joan D Vinge, Julie Stevens, Mildred Downey Broxon, Cyn Mason, PA Kagan, Sharon Webb, Pat Cadigan, Lee Killough, PJ MacQuarrie, Tanith Lee, Stephanie A Smith, Cherie Wilkerson, Janet Asimov, Beverly Grant and Hope Athearn. None of the stories are especially well-known. Despatches from the Frontiers of the Female Mind, Sarah LeFanu & Jen Green, eds. (1985) During the 1980s, The Women’s Press published a number of science fiction paperbacks by women writers, all in similar grey livery. This was the only anthology. It contains original stories by Josephine Saxton, Margaret Elphinstone, Joanna Russ, Gwyneth Jones, Beverley Ireland, Tanith Lee, Lannah Battley, Pamela Zoline, Mary Gentle, Frances Gapper, Lisa Tuttle, Pearlie McNeill, Naomi Mitchison, Zoe Fairbairns, Penny Casdagli, Raccoona Sheldon (AKA James Tiptree Jr) and Sue Thomason. Many of the authors also had novels published by The Women’s Press, reprints and original. The Zoline is a coup – she has only ever written five stories… and one of those was original to her collection, Busy About the Tree of Life. Jack Deighton reviewed Despatches from the Frontiers of the Female Mind on SF Mistressworks here. 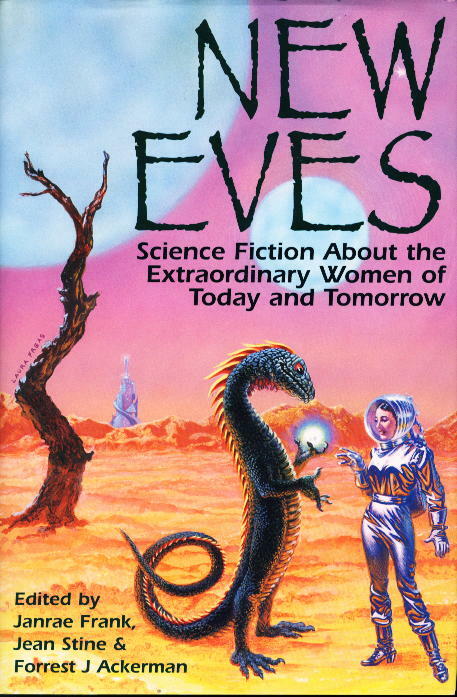 New Eves: Science Fiction About the Extraordinary Women of Today and Tomorrow, Forrest J Ackerman, Janrae Frank & Jean Marie Stine, eds. (1994) An excellent introduction to science fiction by women from the genre’s beginnings through to the year of publication of the anthology – indeed, the anthology is organised by decade. The editors’ introduction is mostly good, but sabotages itself with a final section which undermines the quite sensible argument presented in the preceding pages – no doubt the lone male editor insisted on this. The stories are organised into sections by decade: ‘The 20s & 30s’, ‘The 40s’, ‘The 50s’, ‘The 60s & 70s’ and ‘The 80s – and Beyond’. Not all of the older stories work for modern readers, but it’s good that they’re documented – works by Francis Stevens (AKA Gertrude Barrows Bennett), Leslie F Stone and Hazel Heald, for example. Later authors may be better known but there are still many who have been unfairly forgotten. I reviewed the anthology on SF Mistressworks here and here. 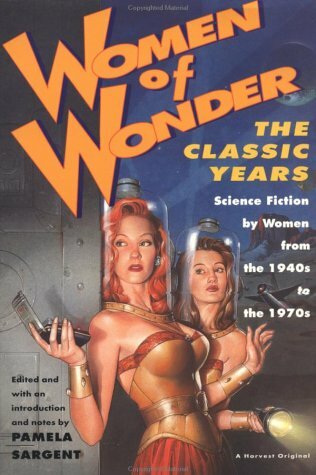 Women of Wonder: the Classic Years, Pamela Sargent, ed. (1995) The first of a pair of reboots of the Women of Wonder series, it actually contains more stories than the the original three volumes – and, in fact, contains many of the stories from those anthologies. 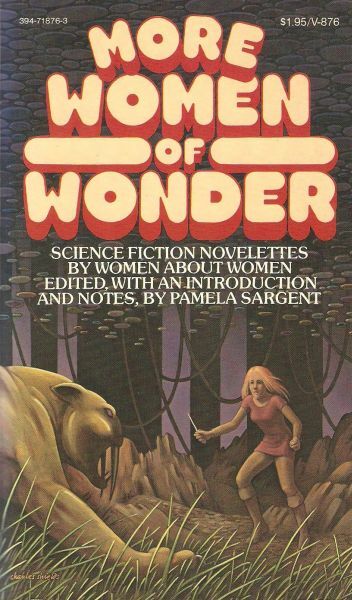 Zenna Henderson, Margaret St Clair and Lisa Tuttle are new to the volume, and CL Moore, Leigh Brackett, Marion Zimmer Bradley and Joan D Vinge are all represented by different stories than those in the Women of Wonder trilogy. As for the rest… The stories by Judith Merril, Katherine McLean, Anne McCaffrey, Sonya Dorman, Kit Reed, Chelsea Quinn Yarbro, Joanna Russ and Vonda N McIntyre all originally appeared in Women of Wonder; those by Josephine Saxton, Kate Wilhelm and Ursula K Le Guin were in More Women Of Wonder; and the stories by Pamela Zoline, James Tiptree Jr and Eleanor Arnason were in The New Women of Wonder. There is enough of a difference to consider buying this book if you own the original trilogy, but perhaps less of a reason to track down the three Women of Wonder anthologies if you have this one. Women of Wonder: the Contemporary Years, Pamela Sargent, ed. (1995) While the “classic” volume covered the years 1948 to 1977, the same years covered by Sargent’s original trilogy, this one covers the following two decades – with stories from 1978 to 1993. Contributions are provided by CJ Cherryh, Tanith Lee, Suzy McKee Charnas, Carol Emshwiller, Sydney J Van Scyoc, Angela Carter, Mary Gentle, Octavia E Butler, Jayge Carr, Rosaleen Love, Sheila Finch, Pat Cadigan, Pat Murphy, Karen Joy Fowler, Judith Moffett, Connie Willis, Lisa Goldstein, Nancy Kress, Storm Constantine and Rebecca Ore. Although there are names in common with New Eves: Science Fiction About the Extraordinary Women of Today and Tomorrow, there is very little overlap – only the Van Scyoc story, in fact, appears in both. I reviewed this anthology for SF Mistressworks here and here. Daughters of Earth, Justine Larbalestier, ed. 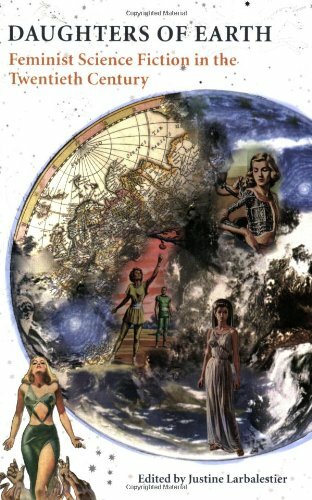 (2006) Unlike the other anthologies in this post, Daughters of Earth is a mix of fiction and non-fiction, as each of the stories is followed by an essay discussing that story and/or its author. Daughters of Earth also covers the widest spread of time of all the anthologies named above – the earliest story is from 1927 and the latest from 2002. The fiction is provided by Clare Winger Harris, Leslie F Stone, Alice Eleanor Jones, Kate Wilhelm, Pamela Zoline, James Tiptree Jr, Lisa Tuttle, Pat Murphy, Octavia E Butler, Gwyneth Jones and Karen Joy Fowler. Some of these stories have appeared in other anthologies mentioned in this post; one or two of them I consider personal favourite sf stories. The non-fiction is provided by Jane L Donawerth, Brian Attebery, Lisa Yaszek, Josh Lukin, Mary E Papke, Wendy Pearson, Cathy Hawkins, Joan Haran, Andrea Hairston, Veronica Hollinger and L Timmel Duchamp. If this anthology has a fault, it’s that it could do with being much larger – it contains eleven pieces of fiction, but I can think of at least another dozen I think deserve the same treatment. ETA: Despite owning copies of them, I managed to miss out both Despatches from the Frontiers of the Female Mind and Cassandra Rising, as noted in the comments below. I have now added them. Other people have pointed me in the direction of themed all-women anthologies from major publishers and small presses, many of which include both science fiction and fantasy. Those, I think, are a post for another day. 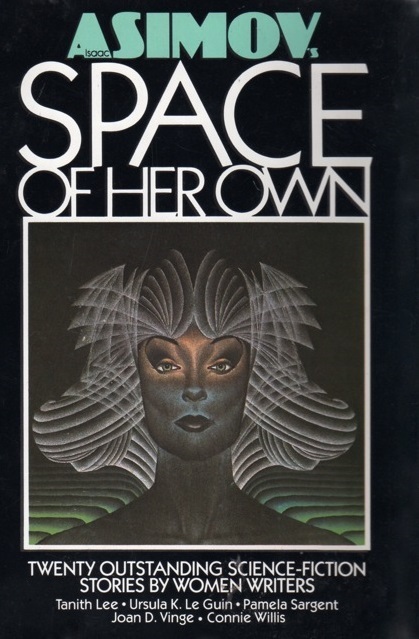 The above are explicitly science fiction anthologies, covering the historical spread of the genre and demonstrating that women have been writing sf since its beginnings. Categories: book list, books, science fiction, women in sf | Tags: justine larbalestier, pamela sargent, virginia kidd | Permalink. You haven’t mentioned the anthology from The Women’s Press, “Despatches from the Frontiers of the Female Mind” edited by Jen Green and Sarah Lefanu. I must admit that when I first read the stories I was not too impressed, but maybe it’s time for a re-read. Stories by Joanna Russ, Mary Gentle, Gwyneth Jones, Lisa Tuttle, Racoona Sheldon and several more, so the quality of writers is pretty good. It is well worth a look. You missed an anthology entitled “Women at War” (eds. Bujold and Roland Green), which consists of military sf/fantasy , mainly by US female writers. The slightly odd mix of selection criteria accounts for many of the writers coming out of sf media fandom – or should that be the other way around? There’s probably a substantial number of themed anthologies with female-only contributors. I’ve mostly been concerned with historical science-fiction-only women’s anthologies – ie, ones that demonstrate women have been writing sf since the genre’s beginnings. There’s probably an entirely new post in themed anthologies and ones from small presses with all-female TOCs…. haha, no problem — I think it fits nicely with the chronology. The huge upsurge in the 70s and the almost complete abandonment of women only sf collections by the late 80s (until recently). It’s a sad thing to realize when the numbers skew so heavily one way. I’ll definitely have to make it a point to pick up a few of these.